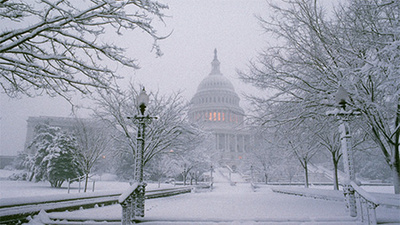 Here in Washington D.C., the nation’s capital, we were drilled over the past few days to expect the snowstorm of the century. A minimum of 12 inches of snow were forecast and major anticipatory adjustments were taken. For example my health care office called to let me know about their closure – since the commute would be unbearable. Schools were closed (or on a ‘contingency’ basis), and even the visit of German Chancellor Merkel was postponed due to concerns about the plane and its landing. As I looked around me, I was startled to find myself just as Democrats must have felt on November 7th of 2016. With Mrs. Clinton’s election about to take place, a big national transformation was coming and, that change, like a snowstorm, would cover everything. Soon after, all of us would be able to ski, skate, and sled to our predestined output locations. Not! Many leading minds had already made key preparations for their indubitably arriving life changes. Some had moved to Washington already, others at least selected a location where to live (yes, McLean has a great school system) or had come for a visit. For them, just as for the school kids waiting for the snow day, dreams and hopes collapsed after all that luminous white cover turned out to be less than an inch deep, and life moved on, albeit in a non-expected direction. What a disconcertment! So- like it or not – we now have a President Trump who is at the national and global steering wheel and nurtures some very unconventional ideas. There are opponents who try to shovel snow pretending to make it remain on the ground longer. They should listen to the German song “Patrona Bavariae” in which the term for a very brief time is equated with the lifespan of snow in March. No matter what the sometimes-political adversaries say, there will be a Spring, followed by Summer (possibly quite parching for the friends of snow). If we think of having a good harvest down the road, surely a desirable objective, then we must acknowledge that both the snow as well as the summer is there for all of us. It is our obligation to our children and society at home and abroad, to help aim for progress and to build better life conditions. Temporary delays, however cleverly designed, produce overall delayed and even denied outcomes. With all the debates about different measures one needs to keep in mind that whether you measure temperature in Fahrenheit or Celsius, the freezing point of water still stays the same. Progress comes with new thinking, but speeds up when supported on a broad basis. After more than 50 days in office one can’t expect a world of change, even from a U.S. president. But for President Trump having to hold his first cabinet meeting with a number of significant positions still unconfirmed and therefore officially unfilled is like being in a car race but drive a Zamboni ice vehicle. Just think how slowed down we all are for example by the lack of Mr. Lighthizer’s confirmation as U.S. Trade Representative. How will we develop re-negotiators for all the inappropriate trade deals? Who decides new direction in these policy matters? For any world power it is essential not to have to fight on the ground in many locations, but rather to avoid such entanglements, by having other nations and institutions take the acceptable steps before they mushroom into disasters. The most crucial support for such an achievement is the influence of a nation, which results from the projections and impressions a nation conveys. It is here where directions are shaped and world affairs harmonized. Weakening the U.S. and its leader’s ability to successfully project influence weakens the capability of the nation to achieve policy goals without significant exertion and risk. It also raises the potential of creating global positions which sharply restrain success. Let us not make such a grave mistake. The snow has passed. More benign demands and responses will keep us going better, more powerful and quicker! Professor Michael Czinkota teaches at Georgetown University and the University of Kent in Canterbury in the field of International Trade. He served in the Reagan and Bush administrations. His key book (with Ilkka Ronkainen) is International Marketing, 10th ed. Cengage. One cannot expect changes in 50 days, but one ought to expect all rational persons to recognize corruption and irrationality when they see it.